This portrait is of my sister-in-law's father, Bob. 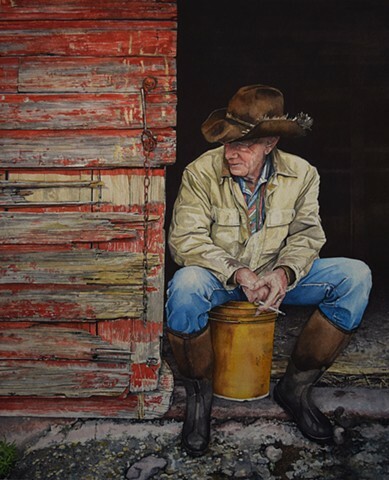 He's a retired rancher from Delia, Alberta, and a quintessential cowboy. It was a fairly wet day, so he's not wearing his cowboy boots, but for me, his pose, next to the worn and battered red barn door, was too hard to resist capturing. This painting was a challenge for me for several reasons. One, I don't usually paint portraits, especially of people I know! Two, the proportions and pose that Bob is in was difficult to capture accurately. I wanted him to really "sit" on that bucket. Three, that Barn door and chain were taking over the whole painting and competing too much with Bob, so I had to tone that down and ramp him up a bit. It was a fine balance, but I think the final result is a success. Thanks to Bob!